IQ (intelligence quotient) according to Sternberg (1996) deals with inert intelligence, not leading to goal-directed movement or action. According to Schenk (2007), IQ only shows current academic achievement. 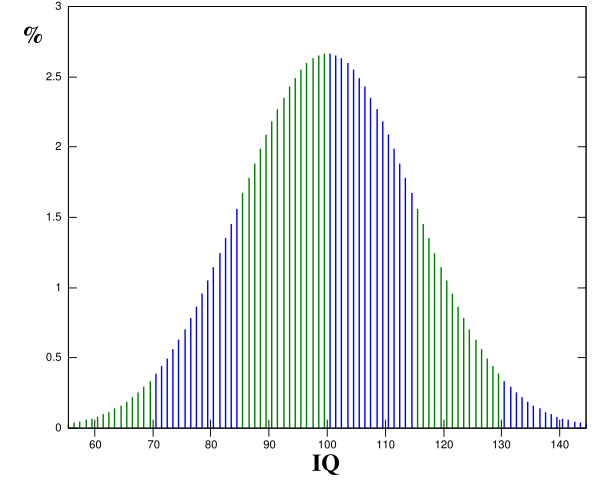 Most people are around an IQ of 100 (see the graph to the left), 50% between 90 and 110, 2.5% score over 130 or under 70. Because of the ceilings in tests, it takes more effort and additional testing to get clear in which areas highly gifted are excelling (Silverman, 1995). “I.Q. does not identify most “talents” or special abilities — and absolutely does not enable us to predict who will grow up to become extraordinary scientists, musicians, teachers, leaders, or athletes. It predicts general success, but not greatness.” Schenk, 2007. According to Sternberg (1996) IQ doesn’t tell about successful intelligence i.e., if a person is capable of achieving his or her goals. Neither does IQ give information about creativity (Taylor, 1975), one of the most necessary parts in solving problems. Practical intelligence is not measured (Miller, 1997) and, according to Howard Gardner (2005), neither is emotional intelligence or personal growth potential. To be able to put intelligence to use one needs practical intelligence to have the practical skills needed to achieve one’s goals, and emotional intelligence in being able to communicate effectively, an essential capability to attain one’s aim. Personal development and learning should be aimed at more than the development of IQ or analytical intelligence alone. It should also focus on acquiring lifelong learning skills on all the different qualities and skills needed (e.g. creativity, practical and emotional intelligence) in order to be able to explore one’s own potential.